Food Worthy of a Fork™. This is the standard to which Merrick holds themselves to. Recipes that are real and wholesome, made with USDA-inspected deboned meat and fresh produce. Our recipes have higher-quality protein and industry-leading levels of glucosamine and chondroitin. None of our ingredients are ever imported from China. It’s health you can see in your dog’s bowl and more importantly in your dog. After all, They Want What We Want™. Merrick Backcountry is an all-natural, grain free ancestral canine diet packed with protein that dogs crave. Merrick Backcountry Raw Infused kibble recipes deliver a perfect combination of protein-rich, grain free kibble plus real, whole pieces of raw, freeze-dried meat. 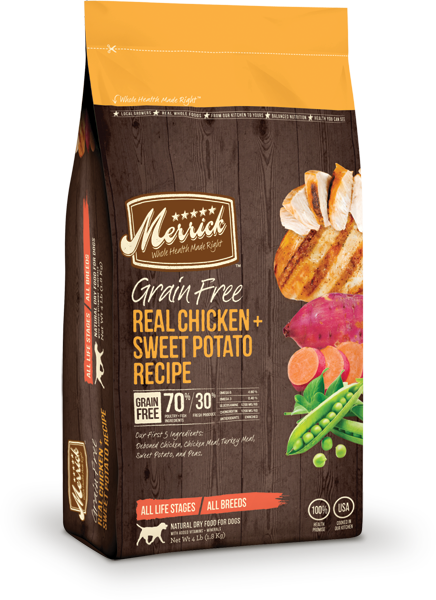 Merrick Classic dog recipes are made with high quality protein, whole grains, vegetables and fruits to provide a natural dog food formula rich in nutrients to support the overall health of your dog. Merrick Grain Free dog food provides a grain free canine diet with all recipes starting with deboned meat as the first ingredient. These award-winning dog food recipes provide leading levels of quality protein, along with farm-fresh fruits and vegetables. Our Merrick Limited Ingredient Diet recipes are specially formulated with a limited number of carefully selected ingredients to provide complete and balanced nutrition for your dog with food sensitivities.